You have decided to get some extra cash by signing up to test a new drug called ALZ-110. When you arrive to the clinic, the lab attendant gives you a white pill that temporarily gives you Amnesia and informs you that the Doctor will be in shortly. The moment the attendant leaves, you learn that the Doctor will not be coming and has been operating illegally. With all the lab staff now gone, you and your group only 60 minutes to locate the antidote in the Doctor’s office. With the clock ticking down, you are slowly losing your memory and your mind. Are they playing a mind game, or is it all in your head? NOTICE: Crawling is required in this room. Please inform us if you have any challenges with crawling. This room is designed for up to 6 players but requires at least 4 participants to solve the room. You have been hired to appraise a private collector’s recent acquisition of antique Sideshow items. 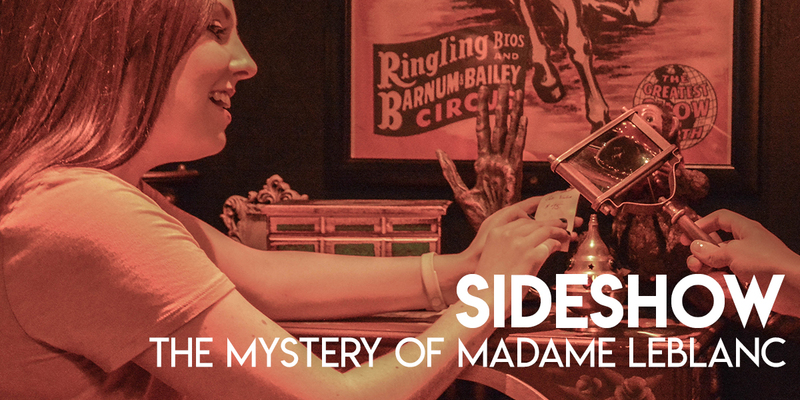 When you enter, a mirror comes to life and tells you the story of the famed Madame LeBlanc Sideshow and the spirits trapped within. Can you travel back in time and release the curse that fell upon Madame LeBlanc and her Sideshow, or will you get trapped with them? NOTICE: Crawling is required in this room. Please inform us if you have any challenges with crawling. This room has a significantly lower lighting level than our other escape rooms. Effect scents and flashing lights are used throughout the course of this adventure. Although this room is not scary, it may be unsettling for younger participants. For generations, Harry Houdini’s escapes have astounded audiences. From handcuffs to straight jackets, there seemed to be no method of restraint that could defeat the legendary escape artist. Some have said that even death itself was no match for Houdini. 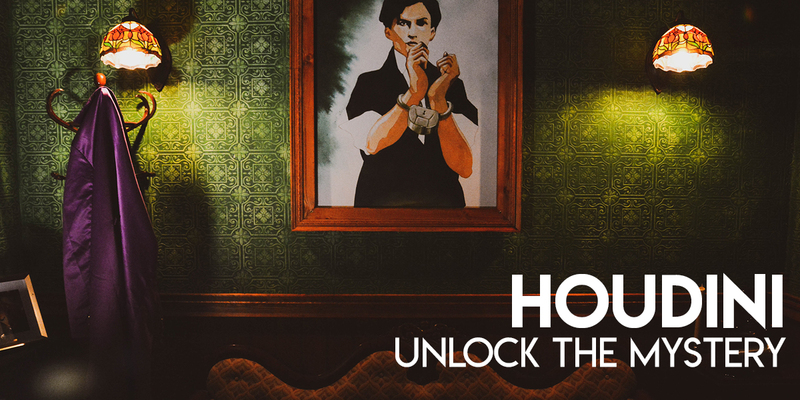 Your team will find puzzles, clues, magical secrets, and some facts about Houdini you may not have known. You will witness some magic take place, and you may even perform some magic yourself. Some say the spirit of Houdini embodies this very room. Harry and Bess had an agreement that, when either of the two passed away, they would try to make contact from beyond the grave to prove or disprove whether spiritualism was a legitimate field of study. They agreed to transmit a secret word that only they knew. Can YOU make contact with Harry Houdini, find the secret word and perform YOUR ultimate ESCAPE? NOTICE: This room is designed around actual Harry Houdini historical facts. The game play references and requires players to view, touch and use a prop “spirit” board. Please contact us if you have any concerns or questions regarding this element of the game play. As humanity has evolved over the centuries, so has our ability to fulfill possibly our most primal need: to play games. 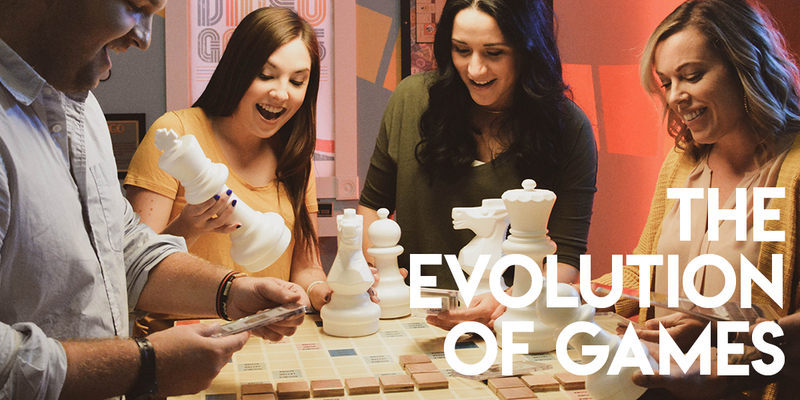 From thousand-year old games like Go and Mancala through today’s video and virtual-reality simulations, we have filled our free time with cards, boards, dice, and all manner of monsters to defeat. This time, the monsters are the games themselves. Can you play through the millennia of game history in under an hour, or will you be left staring at the two most dreaded words in history: GAME OVER? JOIN THE LEAGUE! SAVE THE UNIVERSE! Accidentally teleported to a secret underground lair, you and your team of average citizens must save the earth from assured destruction and escape the clutches of a malicious masked villain. Take on a high-tech challenge like no other in this captivating comic book adventure. 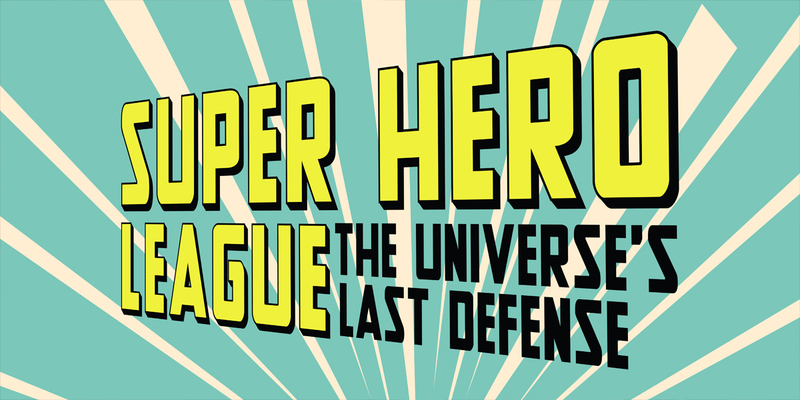 Join the likes of Captain Dynamo, everyone’s favorite hero, and uncover the SuperPotential you never knew you had! NOTICE: Flashing light sequences are used throughout this experience. Some puzzles may be related to color, which will prove to be too difficult for those who are color blind. This experience is difficult and is recommended for ages 14 and up.